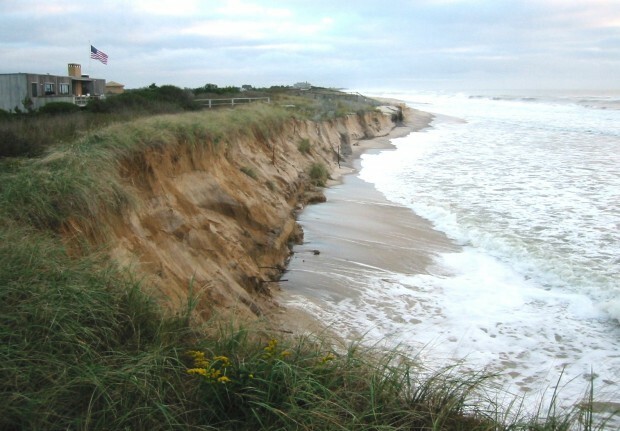 Beach erosion is the removal of sediment from the beach. The layer of sand becomes thinner and narrower and the hinterland becomes exposed. A narrow beach has less recreational and commercial value. The sand may be lost permanently or have moved offshore, from where it will return during a calmer period. A nourished beach is oversupplied with sand that will gradually erode. During the process, a scarp/sand wall is formed, which may be a problem to force. For a more thorough description of Beach Erosion, check here. Storm. When a storm hits a beach it is almost impossible to avoid erosion. The beach may be lost completely and damages made to the hinterland as was the case at Long Island, NY in October of 2004. Luckily, these events happen very seldom for a given beach as there is very little to do to prevent damage. A strong stable foreshore and dune with plants will provide some protection. Groins are known to cause down-drift erosion as the sand in littoral drift is forced away from the coast. This reduces the amount of sand available to the beaches further down. Inlets may trap the sand in littoral drift. A sand bypassing system can mitigate the loss, or frequent dredging of the inlet where the sand is placed on a down-drift beach. However, dredged sand from the inlet may not have optimal beach quality. Poor Beach Drainage can be a major cause of erosion. If the beach does not drain as fast as the sea sinks during falling tide the beach will be full of water and the waves can’t sink in, and the sand they contain is washed back to sea instead of being deposited on the beach. If the beach is well-drained it can accommodate more water, and the swash sinks in easily, leaving sand on the beach during each swash cycle. The sand dries out and is blown to the dunes. 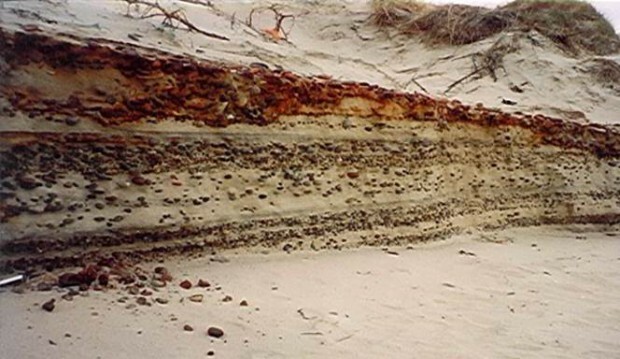 The constant movement of sediment during the tide cycle form layers (strata) in the beach. Some layers limit drainage and others promote drainage. Fine particles such as clay, has the shape of pancakes, and it only takes a tiny layer of clay to limit the drainage. This is why clay is used underneath waste dumps, to ensure that contaminated rainwater does not seep further down and into the groundwater. A beach may have 10 or more layers per vertical foot. The cross-section photo Fig. 3 shows several fine and coarser layers. Typically some of these layers include clay which limits the water’s ability to connect in the beach. It also limits air access to the lower layers of the beach. The result is that during falling tide the groundwater drains at a slower pace than the sea, leaving a part of the beach wet and prone to erosion. A high water input to the hinterland combined with poor beach drainage is a dangerous cocktail that leads to chronic beach erosion. The water may come from heavy rain but could also origin from excessive irrigation. This is often found on highly populated barrier islands, where automated irrigation systems keep the grass green at all times and tarmac covered surfaces allow little water evaporation. A groundwater study performed in February 2008 at Hillsboro Beach, FL showed a very high groundwater level, that could be attributed to irrigation and covered surfaces, combined with poor beach drainage. Another sign of extreme groundwater level is the formation of small drainage channels on top of the sand from the back beach to the sea. This too has been documented at Hillsboro Beach (2014) during a period without heavy rain, ruling out natural causes. As a result, Hillsboro Beach has been critically eroding for decades, except from 2008 to 2011 when a passive dewatering system (PEM) was installed. Sea level rise is for real and has at least two negative effects on beaches. For every inch the sea rises the beach loses a foot or more in width depending on the slope of the beach. Saltwater is heavier than freshwater and is wedged under the land with the freshwater reservoir (groundwater) sitting on top. As the sea rises saltwater moves further inland and pushes groundwater higher. Eventually, this will result in a saturated and unstable ground. The phenomenon is well illustrated in a TED talk by FAU. The elevated groundwater requires the beach to be even better at draining, in order to avoid a wet beach and erosion. That is where PEM comes in.